Tomorrow is Time to Talk day. It’s time to start some conversations about mental health and break down barriers to open discussion. It’s time to end mental health discrimination and stigma. 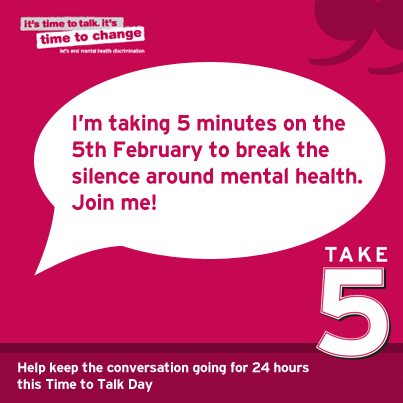 Take 5 minutes from your day tomorrow to have a conversation about mental health, send a message, share a tweet, post on Facebook, write a blog post, read an article but ENGAGE with this conversations because it should be happening everywhere. Mental health affects us all. We all want to be mentally healthy so we should be willing to talk about mental health and mental illness without fear. Here on Thrive In Chaos I have set myself a challenge. I am aiming to share 24 posts in 24 hours, starting at midnight tonight, all around mental health. Some will be brief thoughts or images I have found and want to share. Some will be articles of interest. Some will be deeper musings and some will be resources to hopefully help someone, somewhere. I had hoped to be organised enough to have all 24 posts scheduled and ready to go but it turns out I am just not that organised! Ha! So there may be a lull during the day whilst I’m at work, but there will be at least one post every two hours throughout the day tomorrow (5th February), and later in the day I intend to post more to hopefully hit my 24 posts in 24 hours. I’d love it if you could join the conversation over here and start some of your own. Visit the time to change website to see how you can join in. Let’s make a difference.